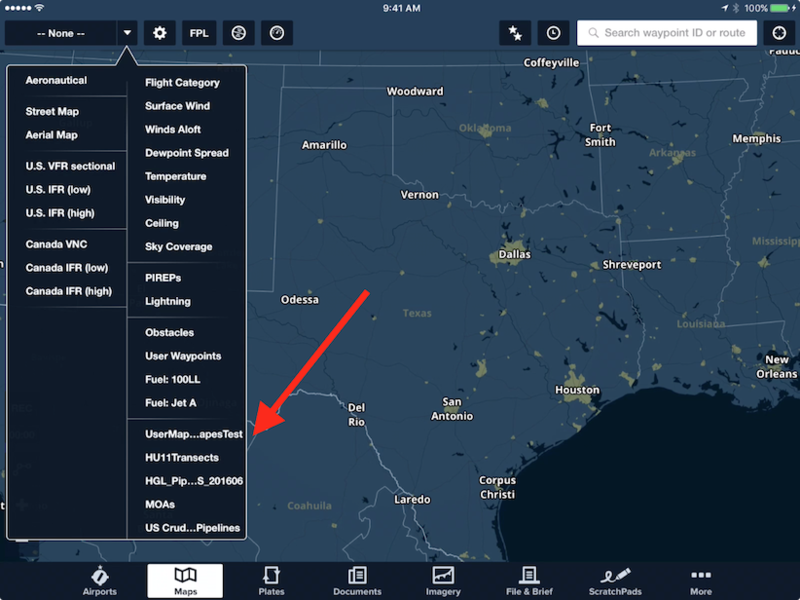 ForeFlight allows you to import and display different kinds of custom user content in ForeFlight’s Maps view: User Charts, User Map Layers, and User Waypoints. This support page walks through the different import methods and details for each content type. 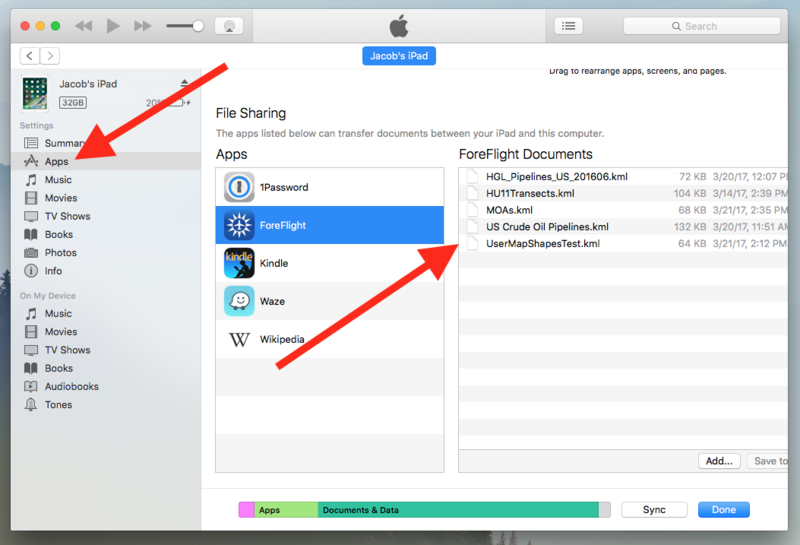 Three import methods are available to get user content into ForeFlight: importing via AirDrop, importing via email or online hyperlinks, and importing via iTunes. Importing via AirDrop from a nearby Apple computer is fast and convenient, especially if a Wi-Fi network is not available. Bluetooth and Wi-Fi must be enabled on both devices for AirDrop to work. You can import .kml, .kmz, and .mbtiles files using AirDrop, but not .csv files. Simply drag one or more user content files from your computer's Finder into the AirDrop folder, and drop them onto the device that you wish to transfer them to. A popup on the receiving device will ask what app you want to send the imported file to. Tap "ForeFlight" and the file will be immediately added to the appropriate list in More > User Content. Importing user content via email or hyperlinks is also easy, and allows you to import files to more than one device at a time. You can import .kml, kmz, and .mbtiles files using email or hyperlinks, but not .csv files. Attach one or more user content files to an email and send it to whatever recipient(s) you want to have the file (which may be your own email address). Open the email in the Apple Mail app and tap-hold on the attachment with the name of the file you want to import. After the share modal appears, scroll through the app list in the middle until you reach ForeFlight, then tap "Copy to ForeFlight". This will open ForeFlight and, if the file being imported is a .mbtiles file, ForeFlight will display a message that the import was successful and add the file to your list of User Charts. If the imported file is a .kml or .kmz file containing more than just points (e.g. lines and shapes), ForeFlight will automatically add it to your list of User Map Layers. If the .kml or .kmz file only contains points then ForeFlight will ask whether you want to import it as a User Map Layers file or as a User Waypoints file. After choosing one or the other ForeFlight will add the file to the proper list. The process above can also be used to import KML/KMZ files from webpage hyperlinks (the hyperlinked KML/KMZ files at the bottom of this page can be used to test the process). Tap on the hyperlink, then tap "More..." and scroll through the app list until you reach ForeFlight, then tap "Copy to ForeFlight" to import the file. Importing user content files via iTunes is slightly more involved than the previous methods, and since it requires a direct USB connection between a computer with the files and the device that the files will be imported to, this method of importing can only be done with one device at a time. The upside of this method is that it can be performed without an internet connection or email access. This is also the only method available to import User Waypoint .csv files. The following video walks through the process of importing KML/KMZ files via iTunes. Note that the User Content tab in ForeFlight is not discussed because the video was made before that tab was introduced. Plug your iPad or iPhone into your computer via the Apple USB cord. Start iTunes on your computer, or wait for it to automatically start. Inside iTunes, click on the icon for your iPad or iPhone. The connected device icon is near the top left of the iTunes screen. Inside the window for your device, click on the 'Apps' listing on the left. It should show all of the apps you have installed on your device. Scroll to the 'File Sharing' section at the bottom of the page and click on 'ForeFlight'. On the right, you will see a table called 'ForeFlight Documents'. If this is the first time you've imported anything to the app, this listing will be empty. Drag your user content files and drop them onto the 'ForeFlight Documents' table. While the files are copying over to your device, you will see a brief 'Sync in Progress' message on your device. If the imported file is either a .mbtiles file, .kmz or a .kml file containing more than just points, ForeFlight will automatically add it to the User Charts or User Map Layers lists, respectively. If the file is a .kml or .kmz file containing only points then ForeFlight will ask whether you want to import it as a User Map Layers file or as a User Waypoints file. After choosing one or the other ForeFlight will add the file to the proper list. Newly-imported User Charts and User Map Shapes will also appear at the bottom of the layer selector, on the left and right, respectively. The names are taken directly from the filename, excluding the extension. Tap on one of the new charts or layers to display it on the map. The User Charts feature supports MBTiles, an open source file format developed by MapBox that allows for efficient compression and distribution of large charts. There are a number of tools used to generate .mbtiles files. A good free option is MapTiler, which allows you to import images, manually georeference them by aligning the image within a coordinate system and then export them as .mbtiles files. .mbtiles files can contain both raster and vector maps, but the current implementation in ForeFlight only supports raster maps. If you import and display a file containing vector data, the part of the chart using vector data (which may be the entire thing) will show hash marks on the map with the words "Unsupported data type". The following files provide some examples of what kind of charts can be imported to ForeFlight. Click on a filename to download it through your browser, or open it directly in ForeFlight using the instruction for importing via hyperlinks above. California-nautical.mbtiles (20.7 MB) - A nautical map of the California coast extending from San Diego to San Francisco. KML/KMZ (Keyhole Markup Language/Keyhole Markup language Zipped) are common file type used for displaying geographic information. If you want to create your own custom shape files, rather than using pre-built files found online, you will need to build them yourself. There are many programs that allow you to build and export custom map shapes as KML/KMZ files, one of the simplest being Google’s “My Maps” program. After creating a new map, follow the instructions here to download the map as a KML/KMZ file. KML/KMZ Files must be smaller than 200MB to appear in ForeFlight version 11.0. All older versions are restricted to less than 4MB. The full KML/KMZ standard supports a very large variety of different data types, allowing you to specify things like simple geometries, time-dependent feature, camera perspectives, and even guided tours. A full list of data types supported by KML/KMZ can be found at the top of Google’s developer reference page. ForeFlight’s User Map Layers feature supports only a small subset of these data types, contained primarily in the Geometry, StyleSelector, and SubStyle groupings (using the organization defined on the reference page). This is sufficient for creating simple or complex arrangements of shapes, lines, and points with support for labels and icon styles. Below is the full list of data types that ForeFlight supports. If you import a file that includes elements not listed here, the unsupported elements should be simply ignored by ForeFlight and the rest of the file will display correctly. The following files provide some examples of the flexibility of User Map Layers. You can view the contents of each file by opening them in a simple text editor like TextEdit. Click on a filename to download it through your browser, or open it directly in ForeFlight using the instruction for importing via hyperlinks above. UserMapShapesSample.kml (65 KB) - Demonstrates the supported icon styles and examples of lines, polygons, and circles. US_Crude_Oil_Pipelines.kml (134 KB) - Basic map showing the network of crude oil pipelines in the US. US_HGL_Pipelines.kml (71 KB) - Basic map showing the network of HGL pipelines in the US. Texas_Counties.kml (1.5 MB) - Shows all county borders in the state of Texas. Alaskan_Coast.kml (3 MB) - Detailed map outlining the state of Alaska. As with other large KML files, there will be a delay of up to a few seconds between tapping on the layer and it appearing on the map as the app works to render the file. There are two places in ForeFlight where you can add new user waypoints: the Maps view and the User Waypoints page in More > User Content. You can also build a .kml or .csv file containing multiple user waypoints for bulk import into ForeFlight - .kml files can be imported using any of the methods described above, while .csv files can only be imported using the iTunes method. The Maps view is the best place to create new user waypoints if you know the location of the point you want to save on the map (by looking at the Aerial map layer, for example), but you don't know the coordinates of that point. Tap-hold on the point (place one finger on the map without lifting it) until the "Add to Route" popup appears. The first line of the popup shows the geographic coordinates and ground elevation at that point. Tap "More" to the right of the line and tap "Save". This will bring up the "User Waypoint" popup, allowing you to enter a name (required) and description (optional) for the new waypoint. Tap "Save" in the top right to save the point as a User Waypoint. You can then display the new point by enabling the "User Waypoints" layer on the Maps view. If you know the geographic coordinates of the point you want to add then you can add it from the User Waypoints page in More > User Content. Tap the Plus button in the top right of the page to open the New User Waypoint form. Enter the name (required), description (optional), and lat/long of the point. Acceptable formats for longitude entry are shown below the form. Tap "Save" in the top right to save the point as a User Waypoint. The User Waypoints page also allows you to edit pre-existing User Waypoints by tapping the blue "i" next to a waypoint. You can view a single user waypoint on the Map without enabling the User Waypoint layer by tapping on a user waypoint in the User Waypoints page. ForeFlight Mobile allows you to import your own collection of user waypoints into the app using a CSV or KML file. CSV is a simple comma-separated format which can be exported from Excel or Google Sheets. KML is an XML-based format that can be easily created from programs like Google Earth. • Be at least 3 characters long including at least one letter. For example, "12A" is okay, but "123" is not. • Be in ALL CAPS. For example, "THE_CABIN" is okay, but "The_Cabin" is not. • Have no spaces between words. Instead, Use a "_" or "-" between words. For example, "THE_CABIN" or "THE-CABIN" is okay, but "THE CABIN" is not. Waypoint Description: You can add a description of the User Waypoint to help you recall the user for the waypoint. If you do not want to provide a description, you must use [""] in the description column. NOTE: Only the first 30-40 characters of the description will be visible in ForeFlight Mobile, so keeping them short is a good idea. Latitude and Longitude: You will need to format your Latitude and Longitude (Lat/Long) values in a simple numeric decimal-degree format (ie: 34.7 or -81.457, where "negative" Longitude indicates W). No other Lat/Long formats are supported for bulk importing. "user_waypoints.csv" with all lower case letters and no spaces. We recommend you also name a KML file "user_waypoints.kml", but any filename ending .kml or .kmz is supported, provided it contains only user waypoints.